Get Roll Up Doors, Commercial Door, Garage rolling Steel Door, Roll Up door, Over Head Roll-Up Door, Rolling Steel Door. Manufacturer of rolling steel doors from self-storage roll up doors to heavy duty commercial steel roll up doors. Jackshaft Operators are used on any door with a shaft, sprockets and chain as a driving element. 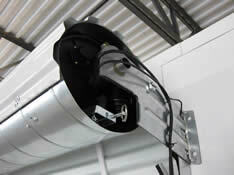 They can be installed on commercial high lift, vertical lift sectional doors, rolling doors or grilles. They are normally mounted on either side of the door. 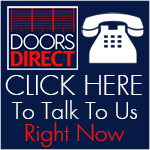 The Pantheon electric door operator from Roll Up Doors Direct International is a unique new technology designed to make installation as easy as 1-2-3. Press the "learn" button a final time... and that's it! There's no moving switches or adjusting cams to get the door to open and close to the required position. Setting the limits on the operator is easier than programming a cell phone and user-friendly for anyone to operate. In the event of a power failure, once the power comes back on the door does not have to be reprogrammed. The logic control retains the memory and will operate seamlessly. Pantheon operators use low voltage DC motors, which are more quiet and efficient than standard AC motors. In the event that the door needs to be operated in the manual condition, the operator can be converted to manual operation with the simple movement of a lever. The door is then operated with minimal effort with an 18:1 chain reduction hoist. The operator is controlled by a logic control which offers a soft start-soft stop feature, ensuring that the motors are not subjected to undue stress during the starting and stopping sequence. The door will come to rest gently and smoothly, helping to prolong the motor life. The logic control has individually controlled opening and closing force adjustments to compensate for small operational imbalances, which ensures that the door is operating at its optimal level. Connections of external devices are simple and easy to complete with removable plug sockets, which allow the wiring to be done away from the logic controller and then simply plugged into the required position. A specifically designed receiver unit and radio transmitter can be connected if required to enable the operator to be controlled by remote control. The logic controller has a front panel, which features a simple LED indicator that provides essential status information as well as UP, DOWN and STOP operation. The logic controller has been designed with software and features to ensure that it complies with the new UL325 standard. Increased strength - the internal reduction gear system enables the motor to lift the door easily, which reduces stress and prolongs the motor's life. Easier to install - electronic limits help save the installer time and effort. Floor level manual release - a simple cable device enables the door to easily be switched to manual operation from ground level. Warranty - operators come with a 1 year warranty against defects and workmanship. Also available in Mini Pantheon (a single motor, 9 1/2" version) and HD (a dual motor 12" version). The Manaras Opera-MH is a medium duty operator designed for use on standard, high and vertical lift sectional doors or small rolling doors and grilles. 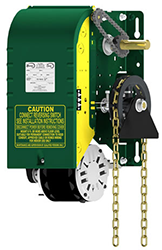 It incorporates the patented Hoist-a-Matic®, a self-engaging chain hoist for manual operation, which simplifies operation and installation. It can be mounted on either side of the door and incorporates the patented Hoist-a-matic, a self-engaging chain hoist for manual operation.